On the 11th February 1978, Fr Paddy O Sullivan PP Crosshaven and ex-PP Murragh and Templemartin, blessed the new Grotto. Six years previously Fr Paddy led a parish pilgrimage to Lourdes and it was from there that the seeds were sown to erect a Grotto in Newcestown. The Mulcahy family donated the land. There is a small rock built into the Grotto that was taken directly from the Grotto in Lourdes. Fr. Paddy was made an Honorary Canon in Lourdes in recognition of his devotion and work in honour of Our Lady. . 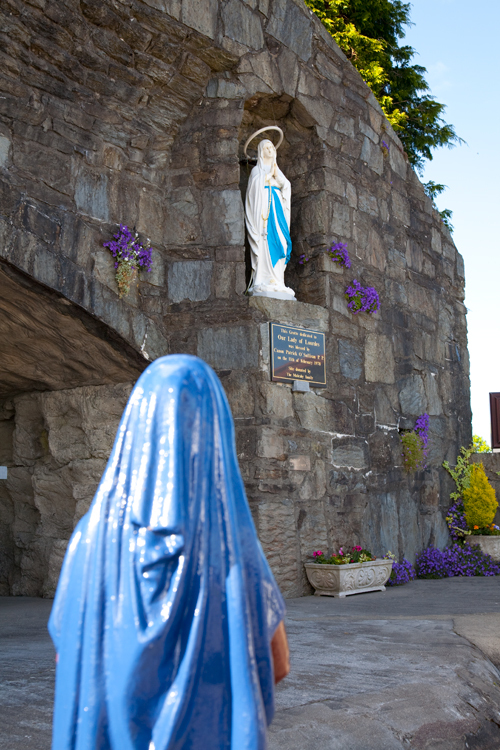 There is a lovely reflection on the Grotto written by the late Chrissie Ryan, Murragh RIP. Stands a beautiful grotto-Our Lady’s abode. There’s peace for the pilgrim who kneels here to pray. As we pray and sing their praise, our faith is buoyant yet.